Packard Bell, one of the leading consumer electronics brands in Europe, today expanded its line-up of MP3 players with the Eclipse portable media player. Featuring a large 2.2-inch widescreen colour TFT display for vibrant movie playback, compatibility with a wide range of media formats, and high quality in-ear headphones, Packard Bell Eclipse offers a comprehensive and affordable mobile entertainment experience. says Emmanuel Fromont, Sales & Marketing Vice President, Packard Bell. In the very competitive flash-memory player segment, our new Eclipse raises the bar for quality, with a big widescreen display and high-quality inear headphones. In keeping with Packard Bell’s tradition of design and performance, the slim Eclipse is barely 12mm thick, making it perfect for enjoying video, photos and music on-the-go. The 2.2-inch TFT display and in-ear headphones are combined to provide a vibrant entertainment experience. The rechargeable, long-life lithium-ion battery lasts for 22 hours in audio playback mode. It comes with a protective case and the display is scratch-resistant. Eclipse is available in three capacities: 2GB, 4GB and 8GB. Ease of use is another Packard Bell hallmark, and the Eclipse features intuitive navigation software and ergonomic scroll wheel. Thanks to Backstage, most audio, video and photos formats can be converted and read by the device. In addition, you can download video or audio Podcasts, and read them on Eclipse, thanks to automatic feed synchronisation. 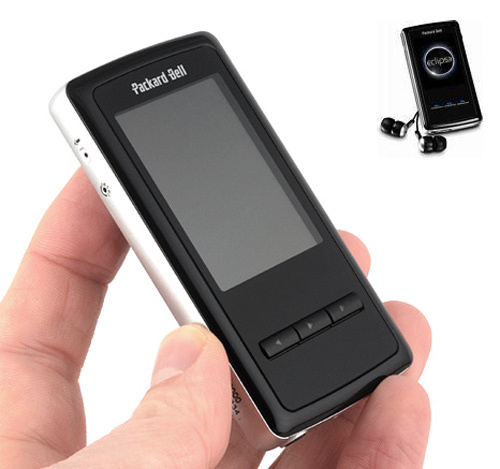 It also features integrated voice recording, games, and the 8GB version comes with FM radio.